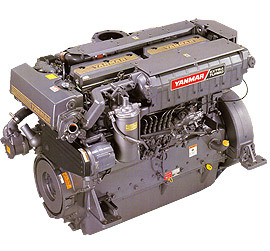 Yanmar Marine's 6HYM is powerful marine diesel engine intended for fast fishing boats, fast ferries and patrol boats. Yanmar Marine's 6HYM marine diesel builds horsepower through massive displacement (13.7 liters) and twin turbochargers flowing a big volume of air through substantial intake and exhaust valves. A nice characteristic of the twin turbochargers, as opposed to one big one, is that they spool up more quickly making acceleration razor sharp over a broad operating range. Fuel economy is enviably good and emissions are low. This comes thanks to the injectors with multiple, micro-sized holes that inject a particularly fine mist of fuel. The finer the mist the greater the number molecules of fuel exposed to oxygen, and therefore, the more BTUs produced per gallon of fuel. Heat equals horsepower. Specially shaped combustion chambers also pump up performance and lower fuel consumption and emissions. NOx levels are low. The boost compensator dramatically reduces black smoke under hard acceleration. Seemingly a contradiction in terms, the grey iron block and cylinder head are high tech. Cylinder liners receive a special surface treatment. the block and head are robust as are the main bearing caps. S = For applications where use of rated power is less than 30 minutes continuous and operation is less than 750-hours per year. L = For applications where use of rated power is less than 2 hours continuous and operate less than 2000-hours per year. M = For applications where use of rated power is less than 10 hours continuous and operate less than 3000-hours per year. H = For applications where use of rated power is 24-hours or below and typical operation is 4000 hours per year or greater.